Objective: To describe the relationships of lifestyle characteristics to changes in vision and incidence of visual impairment (VI) over a 20-year period in the Beaver Dam Eye Study (BDES). Design: Longitudinal, population-based cohort study. Participants: A cohort of 4926 persons aged 43 to 86 years participated in the baseline examinations in 1988e1990, and 3721, 2962, 2375, and 1913 persons participated in follow-up examinations in 1993e1995, 1998e2000, 2003e2005, and 2008e2010, respectively. 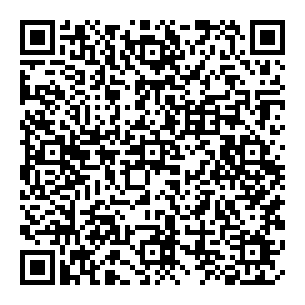 Methods: Best-corrected visual acuity (BCVA) measured by a modified Early Treatment Diabetic Retinopathy Study protocol. Main Outcome Measures: Change in number of letters read correctly and incidence of VI based on BCVA in the better eye assessed at each examination over a 20-year period. Results: The 20-year cumulative incidence of VI was 5.4%. There was a mean loss of 1.6 letters between examinations, with a 20-year loss of 6.6 letters. While adjusting for age, income, and age-related macular degeneration (AMD) severity, being a current or past smoker was related to a greater change in the numbers of letters lost. Persons who had not consumed alcoholic beverages over the past year and sedentary persons had higher odds of incident VI than persons who drank occasionally or who were physically active. 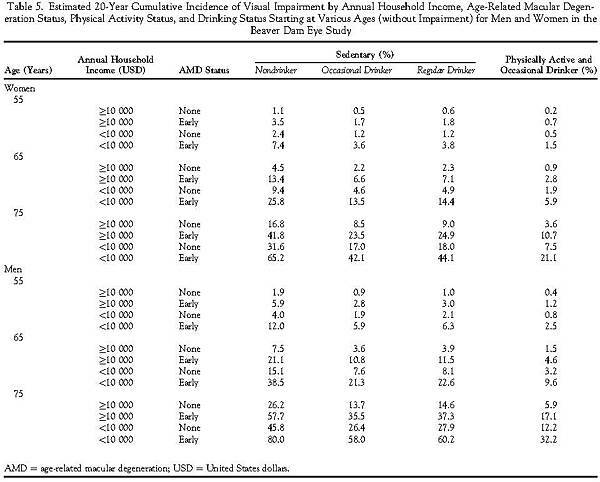 For example, in women with early AMD and annual household income less than $10 000, the estimated 20-year cumulative incidence of VI in those who drank occasionally and were physically active was 5.9% compared with 25.8% in women who had not consumed alcoholic beverages over the past year and were sedentary. 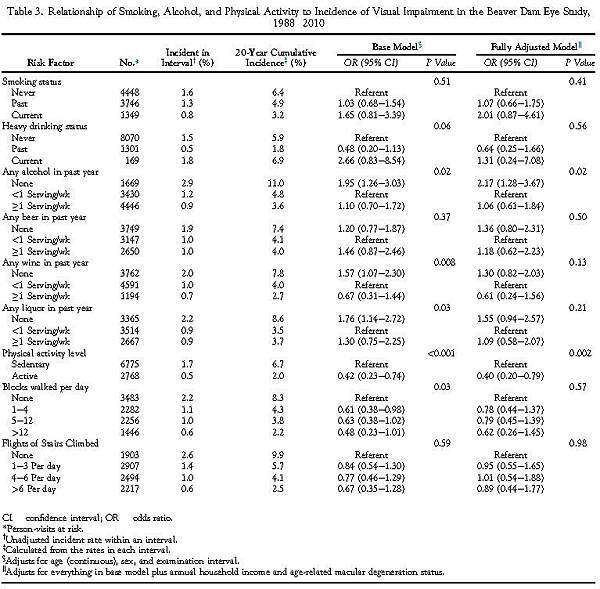 Conclusions: Three modifiable behaviorsdsmoking, drinking alcohol, and physical activitydwere associated with changes in vision. Further evidence that changes in these behaviors will result in less loss of vision is needed because of the expected increase in the burden of VI due to the aging of the population. 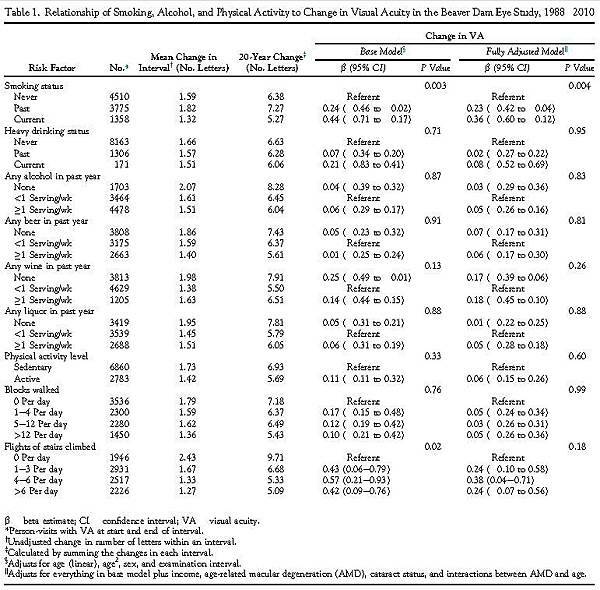 Klein, R., et al., Relation of smoking, drinking, and physical activity to changes in vision over a 20-year period: the Beaver Dam Eye Study. Ophthalmology, 2014. 121(6): p. 1220-8.